Kate’s experience with children and adolescents spans over the course of 10 years. 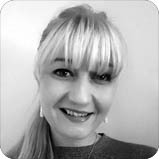 She specialises in crisis intervention using evidence based approaches to guide her practice. Kate has specific experience with anxiety, panic, separation anxiety and attachment, depression, self-harm, suicide ideation and attempts, addiction and family discord. She works with parents to psycho-educate on the highly transitional and developmental stage of adolescence. Kate works with the child or adolescent in the context of the family. Although there is no specific timespan on therapy, the assessment will take place over the course of the first two sessions. The completion of the assessment will inform the therapeutic pathway. Kate also works with children who have been diagnosed on the Autism Spectrum Disorder (ASD). She also works with adolescents and young adults with Aspergers Syndrom and parents of adolescents on the ASD.